Hope everyone enjoyed their long weekend (or hopefully had a long weekend!). Activity trackers seem to be the biggest rage these days and I avoided them for as long as I could. 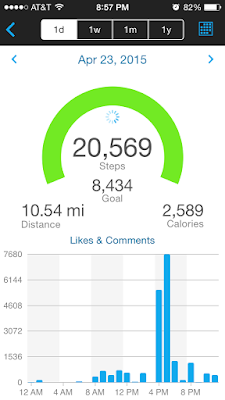 Then one day my sister posted a picture of her app she had on her phone - nothing fancy it just tracked steps - and it was free so I immediately downloaded it. Within a day I was definitely addicted. But my already poor iPhone 5 battery was being demolished having the app running in the background (as was the lack of being able to be freed from my phone if I wanted to track). So I took the plunge. I bought the Garmin VivoFit (the original not the second version, since I like to save money and I was okay with it). And, I am in love with it. I got it and it has not left my wrist in the past month. It is oh so simple. There is no charging, it syncs within seconds (via bluetooth) to your phone or computer and the interface online has a lot of potential - and it also tracks your sleep. The one downfall of the original version I will mention is no backlight. So if you are going to bed and want to press it to sleep mode you can't see. But as I have learned it is also intuitive and will realize when you aren't moving anymore and figure out when you are sleeping for the night even if you don't put it to sleep mode! So smart! I was honestly most concerned with steps and being active every hour so I have not engaged a lot with all it can do online. But I have to say it has very much changed my activity level. I am cognizant of getting up and checking that darn red line that begins to grow after an hour of activity. I also find myself going on more and more walks. Even the weekends first thing I either walk for coffee or make a coffee and go for a walk (if not working out first thing). 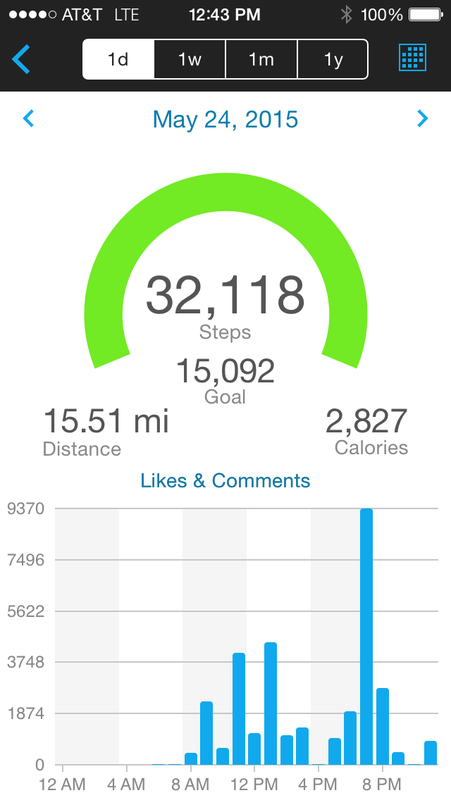 You can see below: in the beginning my goal for steps was slightly under 8,500 per day. Now, it has grown to over 15,000 day. And that was within a month. It is intuitive in that it alters the step goal every day to adjust to your normal daily activity. This, is where I think it is a bit detrimental for me. My competitive attitude (with myself) sets in and I have to exceed that goal. Obviously on one hand that is good for me, and has set some very healthy habits. On the other, it has played to my already slightly obsessive tendencies and I notice I get a bit of anxiety with "needing" to demolish the goal for the day. So yes, it has me walking EVERYWHERE (I haven't taken the subway in the past month I don't think or a cab) and I walk the stairs a few times a day up the 12 flights at work and then some, I get up when watching TV to move about; but on the other hand I have definitely developed an attachment to it. I didn't want to wear it the other night because I was going out and it just didn't "go" obviously but that gave me a little anxiety. Not a good thing. But I have a very all or nothing attitude. I think at the end of the day it is definitely something that people can benefit from as far as becoming more active. And even for those of us that don't have a problem being active (as in working out/training for an event etc) I think it shows you just how your activity trends during the day. You can work out and be in shape but still be too sedentary. I feel like I would be so depressed by my lack of activity other than when I'm working out haha... but I should probably get one of these just to inspire me to move more!